How to create Pop Art/Comic Book Make-up? Carnival party, New Year’s costume ball, comic book dress up, or yearly student carnival? Pop art stylisation is always the good solution! 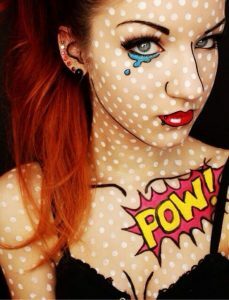 Comic book make-up will make your face look unreal and in combination with colourful stylisation it may look stunning. Meet few simple steps to Pop Art make-up. Natural foundation or (to enhance the effect) a tone brighter. Black eyeliner (best waterproof) or lasting eye pencil. Garish eyeshadows e.g. bright yellow, pink, etc. Light blush (best would be matte than highlighting). Increasing length mascara or false lashes. Red and soft lipliner or paint in the same colour. White face paint (this is optional). We start Pop Art make-up, like any other make-up, with foundation. Brighter tone will give artificial appearance to our face and that is the desirable effect in this make-up. However, too white might not look too good. On our cheeks we should apply some light matte blush without illuminating particles. The entire upper eyelid should be covered with eyeshadow in chosen colour. Colour palette is limitless (yellow, red, pink, blue, violet or green), but it is important for the colour to be matte and very vivid. We apply it without blending and leave delineative edges. On lips we should administer dark and expressive lipstick e.g., red, violet or brown. In Pop Art make-up it is important to outline the edges just like in comic book sketch. With black eyeliner emphasise not only upper and lower eyelid (you can finish the lines with sketch in false lashes), but also eyebrows (pointed, artificial and oversized) and edges of the eyeshadow and lipstick. We should contour the face with black lines on cheek bones, the bridge of the nose, chin and around our face. Red lipliner or paint are great for strategically placed dots all over your face. This way we limit the effect of spot-fill contours in comic books. This step is optional. We can add subtle spot with white paint on the lower lip to give our lips 3D look in Pop Art style.